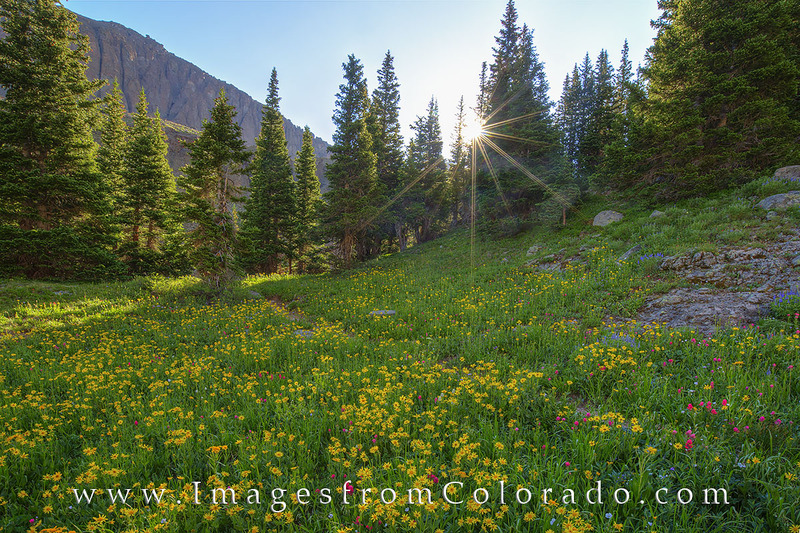 The Blue Lakes hike near Ridgway, Colorado, is well known for summer wildflowers. This wildfower photograph was taken before you reach Lower Blue Lake. The sunshine was streaming through the pine trees, and the golden flowers were blanketed across the green field. This little portion of the San Juans was simply beautiful. On the Blue Lakes hike just outside or Ridgway, Colorado, I was between the Lower and Middle Blue Lakes when I noticed the sun streaking through the pine trees. At the same time, I was following a path through an amazing stretch of golden Colorado Wildflowers. I had to stop and capture the moment as best I could. I moved on and eventually found my way at the Upper Blue Lake, but this portion of the trail between the first two lakes was the most beautiful portion of the trek. Photo © copyright by Rob Greebon.